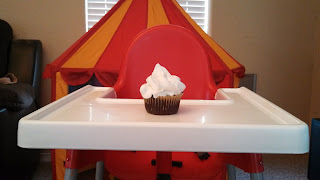 We had a funtastic first birthday party for my little man a couple weeks ago. We set up a little baby circus play tent and turned his pack n play into a baby ball pit and set a little baby buffet with all his favorite foods. His cousin who is just a few months older was there to join in all the baby fun and I think the adults had a good time too. As a special treat I made egg free grain free dark chocolate cupcakes. They turned out amazing if I do say so myself. So I thought I would share the recipee. Over a double boiler (a nice large glass bowl over a pot of boiling water) melt butter, coco powder and dark chocolate together mixing constantly with a whisk or hand mixer. Take bowl off heat and mix in all other ingredients - just dump it all in there, go for it! It will all come together just fine! These are very rich and dark so we decided to top them with whipped cream. I think a heavy frosting would be just too much. Maybe a dusting of powdered sugar might be nice. Keep it simple. My little smarty of a boy signed his first two sign combo after eating his birthday cupcake. ALL DONE + HELP = "I'm done! Help me out of this high chair!" Haha. It was really cute.